This isn’t necessarily “preserving” food, but using up leftovers rather than wasting them is related to food preservation, right?. In our house, leftover steak is about as rare as leftover wine, but occasionally both those things happen. (You know, once a decade or so). More frequently, we have cuts of meat that aren’t super tender or perhaps were accidentally overcooked. What to do with these bits? You could make them into stew, where the rich, thick texture of the broth and the tenderness of the vegetables would probably mask the chewy-ness of the steak, OR you could make a meal that will encourage you to restrain from eating a whole steak just to be able to make steak bites! I first stumbled upon this recipe when trying to learn how to cook cube steaks. We started buying bulk beef when we moved out to the country 2 years ago, and among the cuts from the mixed quarter I was familiar with, were several I was not. What’s a London Broil? What’s an arm roast? What’s a cube steak? I think before getting this beef I must have imagined cows were only made into ground beef, ribeye, filets, porterhouses, and strip steaks. My eyes have been opened to this amazing world of flavor and variety, and my keyboard is beginning to fade from searching for new recipes! This one is a keeper. I would also go as far to say that probably anything Ree, the Pioneer Woman comes up with is a keeper. (In fact, just in the time it took me to find this link amongst all her delicious recipes I got sidetracked and planned out half of next week’s menu…) But this for sure is one of the most delicious meals to grace my kitchen, and is oh-so-easy to make! For the full recipe using cube steaks, check out this blog. This is my slightly modified version that I use for a quickie fix for leftover steak. 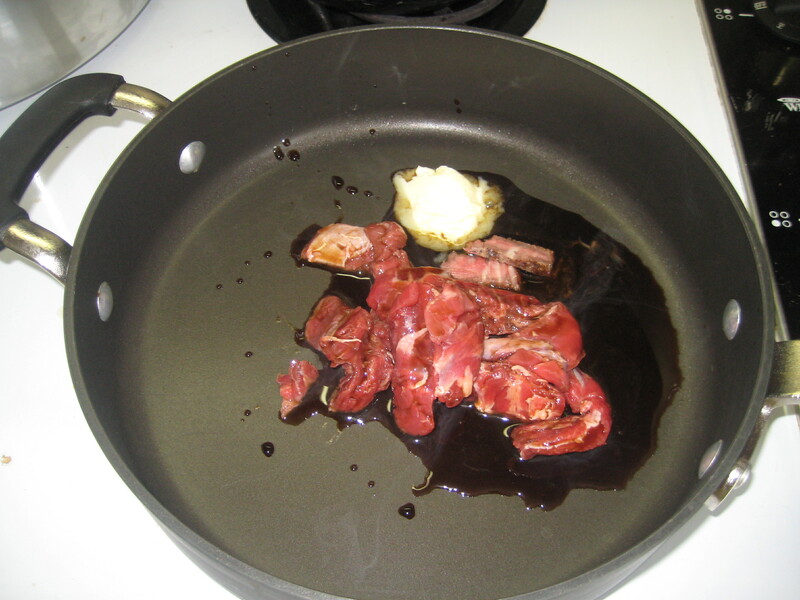 You want about equal parts Worcestershire and butter, and enough of both of those things to make a decent amount of sauce to saute your steak pieces in. You’ll have to eyeball it depending on how much steak you have. First step: melt the butter in the pan. 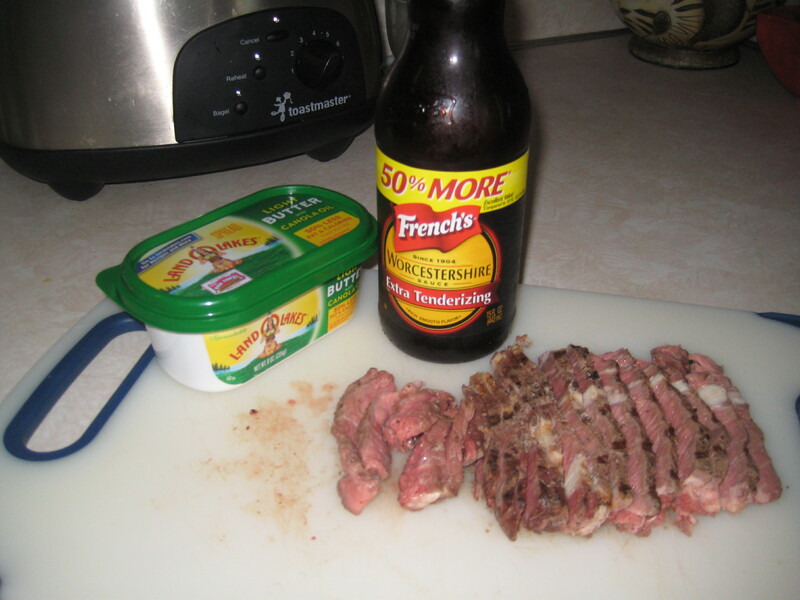 Once it’s melted, toss your steak in there and add the Worcestershire. 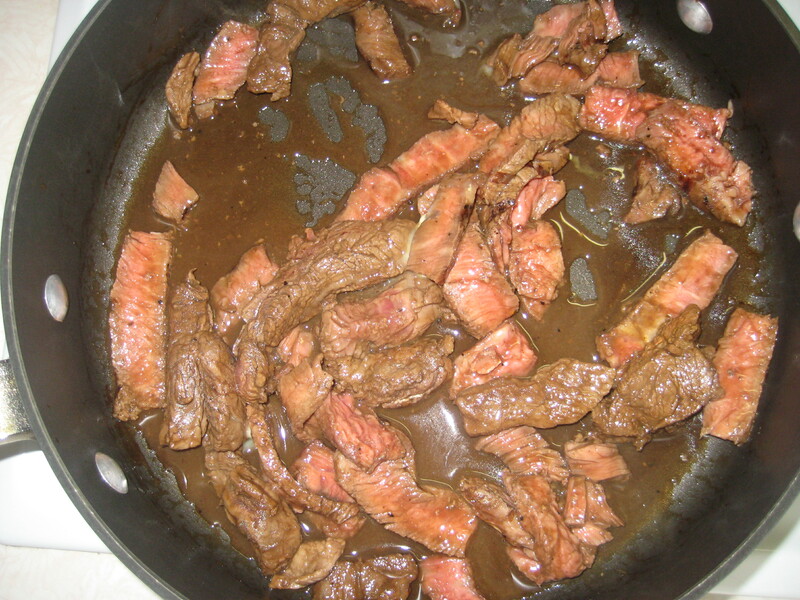 Flip it around a bit until the steak is warm, (warm, not burnt to a crisp! It’s ok if there’s still some pink! Pink is good!) then enjoy! These are great just as they are (even cold!) or are also great made into a sandwich on buttered toasted rolls. If you’re an onion-lover, you could also caramelize some in the butter before adding the steak, too. Go make it, then come back and rave!